This Fall, I will be participating in the ASPCA Virtual 5K! I am excited to be participating and honored to be raising the awareness and the much needed funding to support the ASPCA's programs. Your donation will help the ASPCA provide life-saving programs and services to millions of animals nationwide. The ASPCA is very important to me and I appreciate your help as we fight to give abused and homeless animals a second chance at life. Please support me by making a donation and help me make a positive impact in the lives of animals! Thank you! 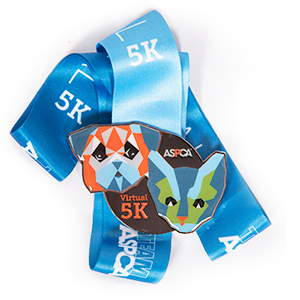 Want to join the ASPCA Virtual 5K? About the ASPCA: Fighting for animals is a 24/7 job, but your commitment makes it possible for our life-saving programs to create happy endings for those innocent lives touched by cruelty. Every single day of the year, we are rescuing animals from neglect and suffering. With your support, we are able to rescue animals from cruelty, work to end animal homelessness and provide medical care for countless pets in need. Please help us save even more animals and donate to this Team ASPCA campaign today.